From 2003, when she completed her PhD (University of Amsterdam), until 2008, Eileen Moyer worked as the research manager and coordinator of the “Anthropology of AIDS in the 21st-Century” research group, based at the University of Amsterdam. This group, which she helped to establish with Anita Hardon, has been remarkably successful, earning multiple research grants and resulting in the completion of more than 15 PhD projects. In October 2008, Eileen Moyer was appointed Assistant Professor of medical and urban anthropology at the University of Amsterdam and, in 2009, received a four-year grant to direct a research team to investigate the social institutions and socialities that have arisen in eastern Africa in conjunction with the expansion of HIV treatment. She has published 28 peer-reviewed articles and co-edited three special issues in highly esteemed medical anthropology journals. She was granted tenure in October 2012. In 2015, she was awarded a prestigious ERC consolidator grant for two million euro to research the relationship between global health gender equality initiatives and transformations in urban African masculinities over the last quarter century. In addition to coordinating her team’s research activities and teaching two courses a year, she is currently supervising 15 PhD researchers and six post-doctoral researchers, and co-editing the journal Medicine Anthropology Theory, which she co-founded with Vinh-Kim Nguyen in 2014. 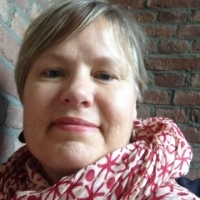 Eileen Moyer is currently an Associate Professor at the Department of Anthropology, University of Amsterdam. Eileen Moyer currently directs an interdisciplinary research group with 18 team members who conduct research on the relationship between global health gender equality initiatives and transformations in urban African masculinities over the last quarter century in Kenya, South Africa and Tanzania. She is personally engaged in research tracking the life trajectories of a group of Tanzanian men she has followed for nearly two decades. For her PhD research Eileen Moyer did extensive anthropological fieldwork on the social worlds and health concerns of urban street youth in Dar es Salaam, Tanzania. After completing her PhD, she conducted critical global health research, focusing on HIV-related care and treatment, sexual and reproductive health, and migrant populations. These studies involved anthropological fieldwork in diverse socio-cultural settings and at multiple levels: global, national and local. Most of her research has focused on eastern and southern Africa, but she has also worked in Haiti and China. Eileen Moyer has also contributed to the development of community level participatory research methodologies and frameworks for use in applied settings and developed theoretical frameworks for analyzing the long-term societal impact of HIV on communities in high prevalence settings. She has also been involved in the training and guiding of researchers and in the comparative analysis of results from multi-sited research.